Minions Rocket Car Battery-Powered Ride-On Just $89! Down From $199! You are here: Home / Great Deals / Minions Rocket Car Battery-Powered Ride-On Just $89! Down From $199! Right now you can get this Minions Rocket Car Battery-Powered Ride-On for just $89 (Reg. $199) at Walmart! Little fans of the popular Despicable Me films will enjoy this Minions Rocket 6-Volt Ride-on Car, which boasts a number of fun features. Faux missile accents adorn the front in deviously cheerful fashion, and a working horn adds excitement. This electric battery-powered ride-on toy boasts a mounted Minion-made Fartblaster that lets kids toot to their hearts’ content. Featuring whimsical graphics and cheerfully colored accents throughout, it offers a molded bucket seat with an adjustable play seat belt. 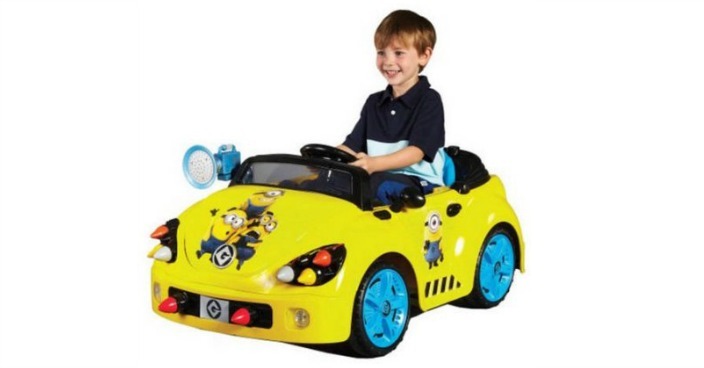 The Minions Rocket 6-Volt Ride-on Car includes an MP3 socket with cord so your little one can plug in a device and listen to stories or sing along to music while cruising. Its maximum speed is 2.5 mph, and the 6-volt battery offers an 8-hour charge time. This comedic little car accommodates kids weighing up to 65 pounds. Certain to please a child who appreciates the Minions characters and their antics, it makes an exciting all-occasion gift.